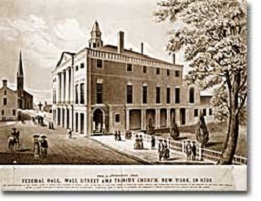 In 1789, Federal Hall in New York City became the home of the first U.S. Congress. 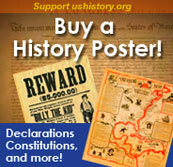 By 1790, Congress moved to the new capital of Philadelphia. At its creation in 1789, the legislative branch was the most innovative. Rule by kings and emperors was an old style of government, and the legislature in many ways represented the new. Almost certainly, the founders intended Congress to have more important powers than the President and the Supreme Court. However, they placed many checks and balances on the legislature that have prevented absolute power in the hands of one branch. Founders controlled power not only by checks from the other branches, but by creating a bicameral, or two house, Congress — the Senate and the House of Representatives. The powers of Congress, then, are both constitutional and evolutionary. 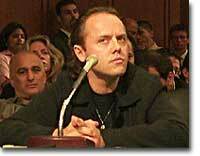 Metallica drummer Lars Ulrich testified before the Senate Judiciary Committee investigation into Napster and other music "piracy" websites. Power over the copyrights he tried to protect are addressed in Article I of the Constitution. The Constitution specifically grants Congress its most important power — the authority to make laws. A bill, or proposed law, only becomes a law after both the House of Representatives and the Senate have approved it in the same form. The two houses share other powers, many of which are listed in Article I, Section 8. These include the power to declare war, coin money, raise an army and navy, regulate commerce, establish rules of immigration and naturalization, and establish the federal courts and their jurisdictions. Representatives and direct Taxes shall be apportioned among the several States which may be included within this Union, according to their respective Numbers, which shall be determined by adding to the whole Number of freePersons, including those bound to Service for a Term of Years, and excluding Indians not taxed, three fifths of all otherPersons [Modified by Amendment XIV]. The actual Enumeration shall be made within three Years after the first Meeting of the Congress of the United States, and within every subsequent Term of ten Years, in such Manner as they shall by Law direct. The Number of Representatives shall not exceed one for every thirty Thousand, but each State shall have at Least oneRepresentative; and until such enumeration shall be made, the State of New Hampshire shall be entitled to choose three, Massachusetts eight, Rhode Island and Providence Plantations one, Connecticut five, New-York six, New Jersey four, Pennsylvania eight, Delaware one, Maryland six, Virginia ten, North Carolina five, South Carolina five, and Georgia three. Section 3. The Senate of the United States shall be composed of two Senators from each State, chosen by the Legislature thereof [Modified by Amendment XVII], for six Years; and each Senator shall have one Vote. Immediately after they shall be assembled in Consequence of the first Election, they shall be divided as equally as may be into three Classes. The Seats of the Senators of the first Class shall be vacated at the Expiration of the second Year, of the second Class at the Expiration of the fourth Year, and of the third Class at the Expiration of the sixth Year, so that one third may bechosen every second Year; and if Vacancies happen by Resignation, or otherwise, during the Recess of the Legislature of any State, the Executive thereof may make temporary Appointments until the next Meeting of the Legislature, which shall then fill such Vacancies [Modified by Amendment XVII]. The Senate shall choose their other Officers, and also a President pro tempore, in the Absence of the Vice President, or when he shall exercise the Office of President of the United States.The Senate shall have the sole Power to try all Impeachments. When sitting for that Purpose, they shall be on Oath or Affirmation. When the President of the United States is tried, the Chief Justice shall preside: And no Person shall be convicted without the Concurrence of two thirds of the Members present. When the federal budget is not approved by Congress, employees don't get paid and many federal services stop. There have been multiple government shutdowns in the last 20 years. Each House shall keep a Journal of its Proceedings, and from time to time publish the same, excepting such Parts as may intheir Judgment require Secrecy; and the Yeas and Nays of the Members of either House on any question shall, at the Desire of one fifth of those Present, be entered on the Journal. Section 6. The Senators and Representatives shall receive a Compensation for their Services, to be ascertained by Law, and paid out of the Treasury of the United States. They shall in all Cases, except Treason, Felony and Breach of the Peace, be privileged from Arrest during their Attendance at the Session of their respective Houses, and in going to and returning from thesame; and for any Speech or Debate in either House, they shall not be questioned in any other Place. Every Bill which shall have passed the House of Representatives and the Senate, shall, before it become a Law, be presented to the President of the United States: If he approve he shall sign it, but if not he shall return it, with his Objections to that House in which it shall have originated, who shall enter the Objections at large on their Journal, and proceed to reconsider it. If aftersuch Reconsideration two thirds of that House shall agree to pass the Bill, it shall be sent, together with the Objections, to the other House, by which it shall likewise be reconsidered, and if approved by two thirds of that House, it shall become a Law. But in all such Cases the Votes of both Houses shall be determined by yeas and Nays, and the Names of the Persons voting forand against the Bill shall be entered on the Journal of each House respectively. If any Bill shall not be returned by the President within ten Days (Sundays excepted) after it shall have been presented to him, the Same shall be a Law, in like Manner as if he had signed it, unless the Congress by their Adjournment prevent its Return, in which Case it shall not be a Law. Effect, shall be approved by him, or being disapproved by him, shall be repassed by two thirds of the Senate and House of Representatives, according to the Rules and Limitations prescribed in the Case of a Bill. No State shall, without the Consent of the Congress, lay any Imposts or Duties on Imports or Exports, except what may be absolutely necessary for executing it's inspection Laws; and the net Produce of all Duties and Imposts, laid by any State on Imports or Exports, shall be for the Use of the Treasury of the United States; and all such Laws shall be subject to the Revisionand Control of the Congress. Revenue bills must originate in the House of Representatives. Although this power is still honored today, it tends to have blurred over the years. Often budget bills are considered simultaneously in both houses. For example, current discussions of possible tax cuts are taking place not only in both houses, but in the executive branch as well. Impeachment power, the authority to charge the President and other "civil officers" with wrongdoing, is given to the House. A simple majority vote can impeach an elected official. Major presidential appointments must be confirmed by the Senate. The Senate offers "advice and consent" to the President by a majority vote on the appointments of federal judges, ambassadors, and Cabinet positions. Treaties with other nations entered into by the President must be approved by a two-thirds vote by the Senate. This provision is an illustration of checks and balances, and it has served as a very important restriction to foreign policy powers of the President. An impeachment trial occurs in the Senate. If the House votes to impeach an elected official, the accused party gets a hearing in the Senate. A two-thirds majority can convict the individual and remove him or her from office. The "elastic," or implied powers, clause gives Congress the authority to pass laws it deems "necessary and proper" to carry out its enumerated functions. Many Congressional powers that have evolved over the years are based on this important clause. Here are a couple. Oversight of the budget. Congress reviews and restricts the annual budget prepared by the executive branch. When a law is passed setting up a government program, Congress must pass an authorization bill that states the maximum amount of money available. When the nation's budget is set, only Congress can set the appropriations — the actual amount available in a fiscal year — for each program that it has authorized. Investigation. Congress may investigate both issues that warrant study and wrongdoings by public officials. Through committee hearings, Congress has examined issues such as crime, consumer safety, health care, and foreign trade. Although Congress must abide by protected individual rights, their committees have examined many allegations against elected officials. Famous recent investigations include the Whitewater and the Clinton-Lewinsky hearings. The American Congress has more power than any legislature among the world's modern democracies. The parliaments of Europe are often "arena" legislatures that provide a forum for debate on policies proposed by a powerful prime minister or president. Only the American democracy enables its legislature with the critical role of setting the lawmaking agenda. The artwork in the Capitol building is a tribute to both the architects of America and Congressmen who have served the country with distinction. These portraits make the Capitol a monument to men and women who have held public office, as well as an inspiration to today's Congress. The University of Virginia provides this website, which has both an interactive map of the Capitol portraits and a history of the pictures. By eliminating an outdated war tax, Congress will save money for 94% of Americans. After years of repeal and reinstatement, Congress will finally kill the long-distance telephone tax created to support the Spanish-American War. This tax has been used to pay for WWI, WWII, and even Vietnam, and takes a few pennies each time you call long distance. When the government shuts down, the nations shudders. Services and resources are either cut off or curtailed while Congress wrangles over the federal budget. CNN explores the conditions that caused the 1995 government shutdown, as well as how it affects the people. Polls on public reaction are also included. Government workers were furloughed and regular citizens couldn't visit state parks or even get passports to travel during the government crisis. Presidents may only serve two consecutive terms in the White House, yet Senators and Representatives may be re-elected again and again. The fight for term limits is difficult because members of Congress must approve something that fires themselves after two or three terms. In an InnerSelf magazine article, one scholar plainly forwards his opinion that term limits are essential to stopping congressional abuses. Over 140 years ago, another President was impeached by Congress. Andrew Johnson, unpopular to many legislators, faced impeachment charges for an unauthorized firing of a Cabinet member. The University of Missouri at K.C. Law School provides historical pictures and political cartoons to complement text testimony (sorry, no RealPlayer in the 19th century). The text includes the highlights from the impeachment hearings as well as from the Senate trial, which was decided by one vote. Instituted by the Founding Fathers to be the "people's" connection to the federal government, the House of Representatives still functions as one of the most important institutions in American government today. Browse through their official website to find personal webpages of Congressmen, current committee pages, and information on bills and laws (using their famous search engine, Thomas). You'd expect more glitter from an official government website, but the ease of navigation makes a visit worth your while.